Living in Canada; one of the upsides to the colder months is the ability to relax by a cozy fire. You don’t want to have a non-working fireplace for winter or worse a chimney fire because you neglected to service your fireplace. 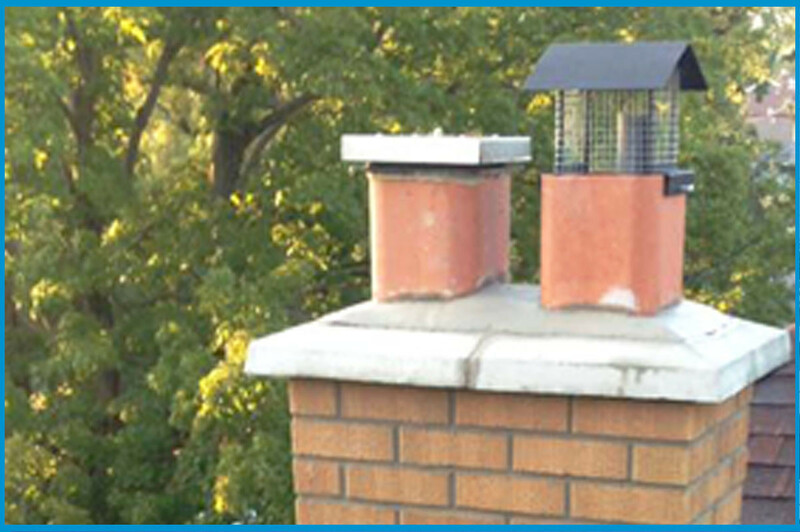 The first action is to inspect the exterior of the chimney for compromised mortar joints. If they exhibit cracks or voids, the chimney should be tuck-pointed. Inspect the top of the chimney for cracks in the cement cap. If necessary have the cement re-mortared, or better; replace the cap with a new poured, or pre-cast cement cap. The next action is to have the inside of the chimney inspected for soot and creosote buildup. Have a licensed, insured chimney cleaning service clean out the inside of the chimney, and inspect the metal liner if one is present. Cost for the service will be influenced by the number of flues, the height of the chimney, and the access, based on the steepness of the roof. This will help prevent chimney fires. Also important is to insure that there are no animals or birds which have gained entry into the chimney. Such animals nesting can cause smoke to back up, or worse, a chimney fire. The installation of rain cap/animal screens are a worthwhile endeavour. Controls for the fireplace; such as damper assemblies, should be in good working order, and one should test that the damper will open and close fully. Be sure to remove any excess ashes in the firebox. If the fireplace is equipped with an electric fan, insure controls are working properly, that internal wiring is not frayed, and that there is no blockage of the exhaust ports. What if you have a wood burning fireplace? If you have a wood burning fireplace; be sure to use well seasoned, hardwoods for burning. Such wood combusts more completely, and does not produce creosote as quickly as wet, damp, or softer woods do. Softwoods are fine to be used to get the fireplace going; but hardwoods such as maple, are best for warmth, and typically burn less quickly. Once a fire is going well, closing the damper slightly will help retain internal heat, as the wood will burn more slowly. Never burn items such as plastic or styrofoam, as they are not good for the ozone layer. Be sure to cut back any overhanging tree branches which may impede the draw of the chimney, or which may represent an external fire hazard. It is also important that the chimney is of sufficient height above the roof, to effect a proper draw. Chimneys which are too short can result in smoke coming back through the firebox, particularly on low-pressure days, or if it is raining; where the tendency is for the smoke to downdraft. What if you have a gas burning fireplace? If you have a gas fireplace; enlist the services of a licensed gasfitter/furnace repairman to clean and inspect the jets which deliver the fuel into the firebox. Additionally, they will check that the igniter is functioning, and that all controls are set properly to deliver sufficient gas to provide a decent flame. Common maintenance can involve the replacement of the igniter switch. Gas fireplaces often use synthetic logs which wear over time. They help to create a realistic, wood –simulated appearance to the fire. They are generally requiring replacement every 2-3 years depending on how often the fire is used. Gas fireplaces also require metal liners within the chimney, and these should be inspected for proper connections between the appliance and the exhausting chimney. What if you have a fuel-burning fireplace? If your fuel fired fireplace, ie: natural gas, or propane, involves an external storage tank; such as in rural applications; it is important to inspect external delivery lines and connections to the storage vessel. To do so; using a soap and water mix around any connections or fittings, as this will demonstrate whether there are leaks. Bubbles will appear if there are exhausting gases. Corroded lines can be a culprit for leaking gas. Simply tightening loose connections can solve the problem if the lines and connectors appear in good order. But if such items are corroded; it is necessary to shut off the gas supply, and have a professional replace any required parts. Also, check supply hoses for cracks or splits. If present, always replace the hoses. Do not attempt to patch. Paramount with any fuel-burning appliance is to have working carbon monoxide detectors within the home, and smoke detectors. They should be present on each floor of the dwelling. These should also be inspected twice a year. Have a working fire extinguisher in close proximate to each internal or external fireplace. Such fire extinguishers should be ABC rated to include use with chemical or grease fires. A growing trend is to have an outdoor fireplace; whether it is wood or fuel burning. This can greatly enhance the enjoyment of outdoor spaces such as patios and decks. Portable fireplaces are available commercially through hardware retailers, or for the more affluent; having a natural stone or brick exterior fireplace adds a tremendous outdoor feature which can be enjoyed for decades, and which can add value to a property. Why not combine a pizza oven? Now that all has been considered for the safe operation of your internal or external fireplace; it’s time to enjoy with that special someone. previousCHIMNEY CLEANING: WHY IS IT IMPORTANT? nextWHAT MAKES AVENUE ROAD MASONRY AMONG THE MOST TRUSTED MASONRY CONTRACTORS IN TORONTO?